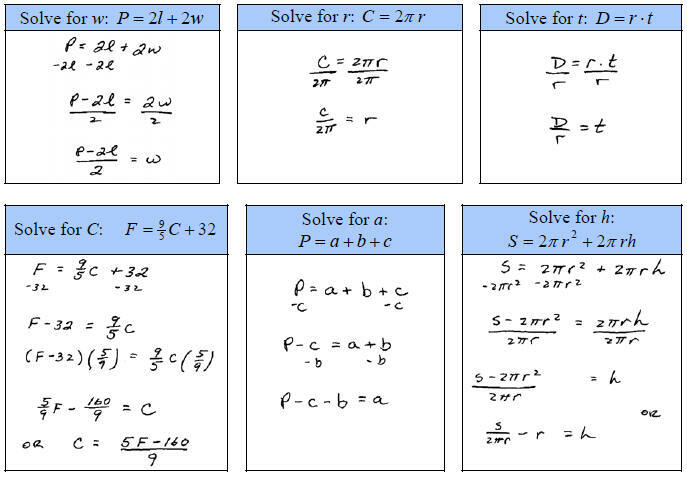 Often you will find that linear equations first need to be simplified before you can solve them. Typically this will involve combining like terms. Combine same side like terms first then opposite side like terms using the techniques we learned in part I. Caution: A common error is to add or subtract a term on the same side of the equal sign. Only use the opposite operation on opposite sides of the equal sign. Not all equations work out to have a single solution. Some have infinitely many solutions such as. Here any number you choose for x will work. Also, some equations have no solution such as x + 1=x. Contradiction – an equation that will always be false has no solution. Identity – an equation that will always be true has any real number,R, as a solution. It is quite common to encounter linear equations that require you to distribute before combining like terms. Look for the parenthesis and distribute before you do anything. Literal equations are difficult for many people because there will be more than one variable. Just remember that the letters are placeholders for some number so the steps for solving are the same . Isolate the variable that it asks you to solve for.